I am fascinated by the Prussian artist Baulduin Mollhausen who accompanied the Whipple Railroad Expedition in 1853-4. When the expedition reached the Colorado River, Baulduin executed numerous scenes of the Mojaves and their surroundings. He reported in his diary that Mojave mothers lined up to have him paint their babies [must have this scene in the graphic novel]. Daily Whip Out: "Balduin Mollhausen"
Heinrich Balduin Mollhausen was born in 1825 in Bonn, at that time a town in the kingdom of Prussia (today Germany). When he was 11, his father abandoned the family and fled to America. Balduin's mother, Baroness Elise von Falkenstein died in 1837 and the boy was then sent to live with an unmarried aunt. 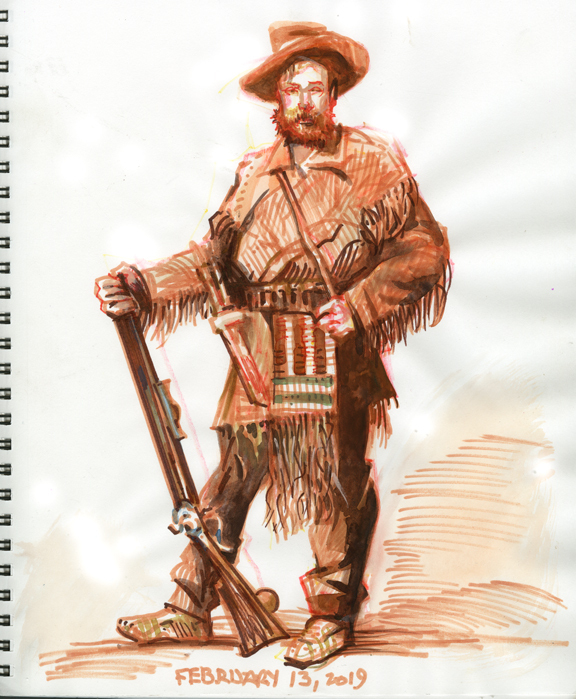 He left for America in early 1850, landed in New York in July and wandered through the Midwest, working as a sign painter, hunter, trapper and court reporter. In 1851 he met Duke Paul of Wurttemberg near St. Louis and was hired to be an assistant for the seasoned world traveler and amateur naturalist. After lengthy trips together Mollhausen learned the ropes of being an artist, although he was not a very good one. In the fall of 1852, the Prussian consul in Saint Louis hired Balduin to accompany a shipment of wild animals destined for the Berlin Zoo, and Mollhausen arrived there in January of 1853. By the time he returned to America in May of 1853, he landed in Washington, D.C., just when Congress was ramping up several scientific expeditions to the Wild West. Through his connections, Mollhausen landed a job as "topographer and draughtsman," with Lieutenant Amiel W. Whipple's Army's Corps of Topographical Engineers who were assigned the task of finding a railroad route to the west coast, along the thirty-fifth parallel. Balduin was paid "$1,200 per annum." In mid-June of 1853 Mollhausen met the expedition at Fort Napoleon, at the mouth of the Arkansas River. Whipple's massive crew—12 wagons drawn by six mules—took off from Fort Smith on July 14, 1853 and traveled through present-day Oklahoma, Texas, New Mexico, Arizona and California. He drew landscapes, camp scenes, river crossings, artifacts and botanical and zoological specimens. He also sketched and painted a number of tribes including the Choctaw, Shawnee, Delaware, Comanche, Waco, Kiowa, Navajo, Apache, Yavapai, Chemehuevi, Mojave and Cahuilla. The expedition made a detour in my home country—eventually Mohave County—going south via the Big Sandy to the Santa Maria River (there were rumors of great mineral wealth on this difficult route and, in fact, Whipple ended up leaving all of his wagons about half way to the Colorado River and they made the rest of the trip by horseback and mule). So this is how they looked as they approached the Mojave camps along the Colorado River. Another illustration I need to do will show the expedition riding up the river bank of the Colorado with Mojaves running along beside them and in the foreground is a crude hut facing us, but away from the soldiers who are advancing on the other side. Inside the hut, hidden in the back, is a very pregnant woman. That pregnant woman is the subject of my graphic novel. "Dear Diary, today is the first day of the 100 years war."